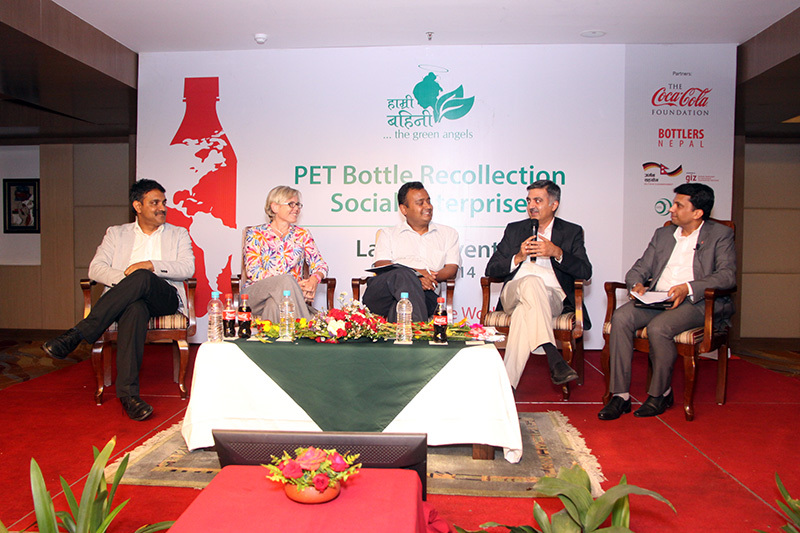 Nepal’s first legal, responsible and environment friendly PET recollection initiative, PET Bottle Recollection Social Enterprise, is formally launched on 12th June, 2014. In a multi-stakeholder partnership involving Coca-Cola, Bottlers Nepal Limited, Gesellschaftfür Internationale Zusammenarbeit (GIZ) GmbH, Himalayan Climate Initiative (HCI), Ganesha Ecosphere, Practical Action and UN HABITAT, this initiative will take the form of a self-sustained Social Enterprise. The program was followed by a panel discussion on ‘Converting Waste into wealth – a model for sustainable living’ with, the Technical Vice President of Coca-Cola for India and South West Asia Mr. Asim Parekh, Chief Technical Advisor of GIZ, Ellen Kallinowsky, Founder and CEO of HCI, Mr. Prashant Singh and Chief Finance Officer of Ganesha Ecosphere Limited, Mr. Gopal Agarwal as panelists. The panelists discussed on the issues and impact of the ecosystem model in PET waste recollection in Nepal. Post the Panel discussion, Salman Rawn, Managing Director, Bottlers Nepal Limited, Coca-Cola SABCO and Bhushan Tuladhar, Country Director, UNHABITAT felicitated two women waste workers. Alok Kohli, Country Manager of Coca Cola for Nepal and Bhutan and Achyut Pyakurel, Head of Practical Action also felicitated two students as part of the HCI Scholarship Announcement.